Regton’s acknowledge Heritage Action was quite right and signal PAS’s outreach is inadequate! 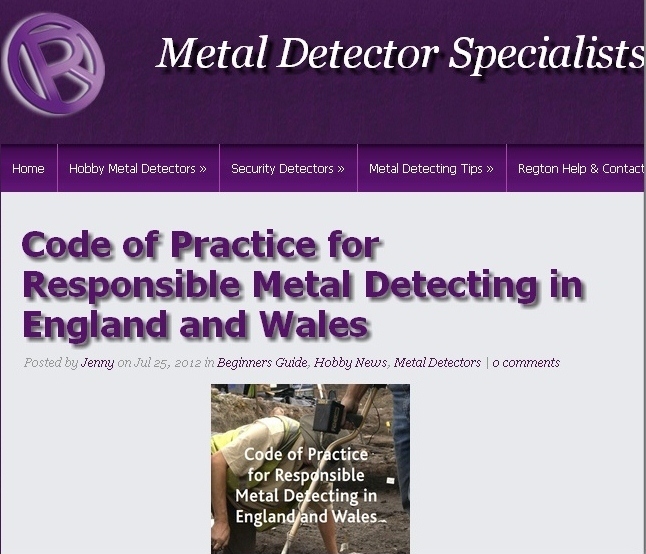 Following our recent article bitterly criticising them Regton’s reacted the very next day by featuring the official Code of Responsible Detecting on their website! So, by virtue of calling a spade a spade we have brought about (in 1 day and free of charge) a big positive step for conservation, one that 15 years of archaeological outreach had totally failed to produce. Britain’s largest metal detector retailer suggests to its customers they might care to act decently towards the rest of the community (or not, if they prefer). We may even have helped reverse some of the probable damage caused by the recent Secret Treasures programmes as Regton’s have also amended their “Advice to Newcomers” to include the clear statement: “You should note the location of any archaeological objects you find and take these to your local Finds Liaison Officer to record it”. Incredibly then, a metal detecting retailer is now making the crucial statement that six days of expensive prime time programming and breathless treasure-blather failed to get across! Of course, this is still artefact hunting so it’s only a token move towards doing the right thing. Regton’s are still supporting the NCMD’s “kid-farmers-you’re-responsible-while-avoiding-the need-to-report-to-PAS” Code and are implying it’s just as acceptable to use as the proper one. Of course, it isn’t, and the artefact hunter isn’t born that could defend it but clearly Regton’s are never, ever going to go as far as dropping it since no-one ever got rich selling detectors without pandering to the wishes of the ignorant, unthinking and unwilling – nor indeed did anyone ever set up a national metal detecting organisation without doing so. Perhaps PAS can take heed of what has happened though. Endless sucking up may not be as effective as – what shall we call it – muscular outreach. There are still hundreds of other artefact hunting organisations (retailers, manufacturers and detecting clubs) citing the NCMD con-Code as being the one to use. If Regton’s can be shamed into at least mentioning the right one then they can too. Or are we to have another fifteen years of polite diplomacy and the avoidance of allegedly “unhelpful” words like “knowledge theft”, “selfish” and “unheroic”? A lot of people, not one of them a responsible detectorist, will be hoping so. Is Mr Stout reading this? Is Dr Bland reading this? Perhaps one or the other would like to comment? This article is written under the paradigm of intellectual superiority or elevated legitimacy of officialdom over the freedom of people to collect artefacts from the land in which they live. Your attitude is by definition a fascist approach to the views and freedoms of others and I’m sure would be laughable to the average Celt/Saxon/Briton although you might have enjoyed support from a few Romans – Caligula, Nero or similar egomaniac! ……………………. authoritarian, or intolerant views or practice. If those who advocate the regulation of artefact hunting are fascists then the world beyond Britain is entirely fascist. You don’t seem to have thought it through, do you! !